NFL Accounts Assistant Admit Card 2019: All the candidates who are awaiting the NFL online written exam 2019 can download the NFL Accounts Assistant Admit Card Online. The NFL Admit Card will be made available on the official website of the National fertilizer limited @ nationalfertilizers.com. Applicants will be able to download the exam admit card directly from the website of the NFL itself. A link has been provided below which you can use to download your NFL Accounts Assistant Admit Card 2019. Kindly make sure that you go through this page for all the details regarding the NFL Accounts Assistant Online Written Exam. We have provided all the information that is currently available about the written exam. More details will be regularly updated here as soon as it becomes available. So make this your one-stop location for all information regarding the NFL Exam Admit Card and Written exam details. Details regarding examination venues can also be found here. Don’t forget to go through the list of cities where the exam will be conducted. Make sure that you are able to locate the exam center closest to you. The NFL Accounts Assistant Exam is set to be conducted throughout the country across a vast number of exam centers. The Exam date has not yet been revealed by the NFL. Therefore, there is no new information available regarding the NFL Accounts Assistant Online Written Exam at the moment. The NFL Accounts assistant Exam will be split into 2 parts. The first of which will be a subject matter exam which will test the candidate’s knowledge of the related subjects. The second part is an aptitude test. This part will feature questions based on the candidate’s general awareness, logical reasoning, and mental aptitude. The online exam will be available in English and Hindi language. The examination will have a duration of 2 hours. The candidates are notified that there will be no negative marks applicable to this exam. Total marks allotted are 150, which includes commerce and aptitude as major topics. All the candidates are notified that the NFL Accounts Assistant Admit card has not yet been released. Kindly stay in touch with us on this page for the latest news and updates regarding the NFL Accounts Assistant Admit Card 2019. Once the Admit Card is released, you can download it from the link that we have provided below. The link will take you to the career page of the NFL website from wherein you will be able to download your NFL Accounts Assistant Admit card 2019. How to download NFL Accounts Assistant Admit Card 2019? On the new page that opens up, click on the NFL Accounts Assistant Exam Admit card 2019 link. Keep in mind that this link will only be available after the admit card has been released. 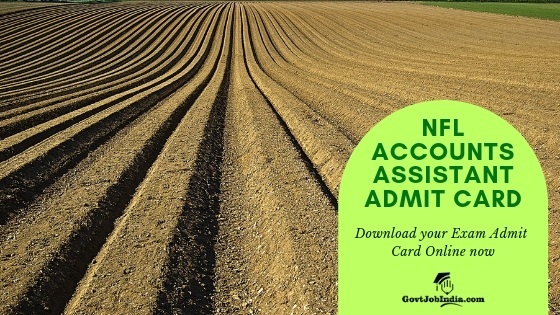 Once you have completed this step, you will be able to download your NFL Accounts Assistant Admit card 2019. Make sure to visit this page on a later time as we will be constantly updating it with the latest news and updates regarding the NFL Accounts Assistant Admit Card 2019. In case you have any doubts make sure that you address them in the comment section below and we will help you out in any way we can. All the best!